CINCINNATI - Designers of the Court and Walnut project use words like rhythm, freshness and connections to describe the $90.5 million project that will include a new Downtown Kroger store. All of those words could matter when GBBN Architects Inc. seeks design approvals from the Cincinnati Historic Conservation Board on July 24. The southern half of the building sits in the Court Street Historic District, where the city can halt development if new construction doesn’t fit the fabric of the surrounding neighborhood. GBBN made sure the building’s lower levels matched the scale of nearby structures. It also set the height of the 18-story tower at roughly the midpoint of Kroger’s headquarters building to the west and the Hamilton County Courthouse to the east – creating a stair step approach for the Central Parkway streetscape. Court and Walnut’s window notches come in clusters of two and three, same as the surrounding buildings. Although it’s modern, GBBN thinks the building repeats patterns found in surrounding blocks. The design is getting good reviews from historic preservation activists. Muller said the Court and Walnut design “picks up the patterns” of Court Street without mimicking its neighbors. That’s a reference to the demolition of the Dennison Hotel building this year and two buildings on Main Street last year for Downtown development projects. The Court and Walnut site has been a parking lot for decades, so no demolition is required. Morgan, an attorney and president of Queen City History and Education, said Court and Walnut is the first building in decades to address a 1920s vision for Central Parkway as “the embodiment of urban modernity.” Built on the route of the failed Cincinnati subway and the former Miami and Erie Canal, Central Parkway was intended to be a grand boulevard lined with important civic and commercial structures. 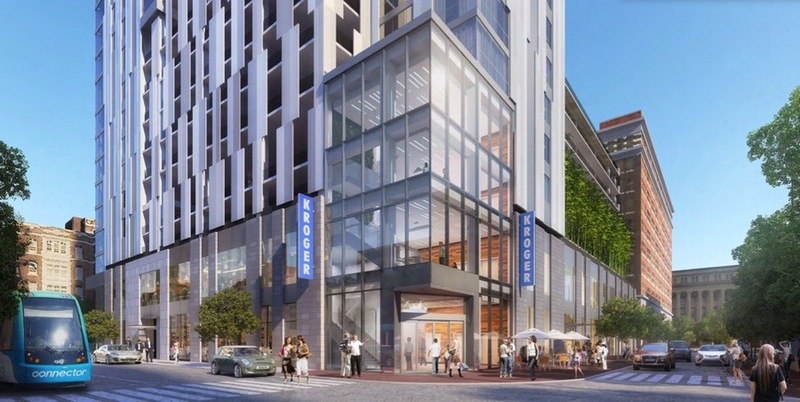 GBBN principal Chad Burke said Court and Walnut’s design flowed from its expected role as an eco-system that connects Over-the-Rhine to Downtown with an urban grocery store and residential tower. Its 550-car garage will accommodate courthouse workers in the daytime, shoppers and apartment dwellers at night. Five streetcar stops within a block of the property, an 18,000-square-foot food hall and a beer and wine bar with second-floor seating that overlooks Central Parkway should keep the place hopping with lunch and dinner crowds. That’s one reason the Kroger store’s entrance is a four-story glass tower. But the entrance also serves other purposes. It roughly matches the height of nearby buildings, contributing to the scale that defines the Court Street business district. And it houses an elevator that Kroger customers will need to get their shopping carts to their cars. Main entrance at the corner of Court and Walnut. Picture by GBBN. The slivers of glass and precast concrete that dominate the building’s upper floors also serve multiple roles. This is how the 18-story tower will look from Central Parkway and Main. Picture by GBBN. Residential developer Tony Hobson appreciates the nuance.